That's all the cash I have left. 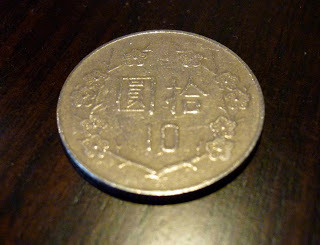 $10NT - about 35¢, which is perfect. If it's one thing about travel that annoys me, it's going back home with $20 or so of local currency in my pocket. Sure, I can simply go to a currency exchange and swap it back to USD, but with the fees that are taken out it's never worth the expense, not to say the hassle. Now it's off to Starbucks/Charbucks/FourBucks to pick up a coffee, to be paid for with the corporate card. I wonder if they'll accept the €5 note I've been carrying with me since September.